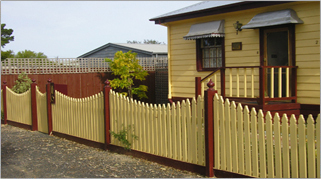 A popular choice for front fencing are either traditional pickets or emu wire/timber heritage designs. Suitable for either heritage style Victorian cottages, Edwardian homes as well as complementary to contemporary homes, there are many varying designs. Pickets made from treated pine or cypress pine are available in a range of shapes, windsor, tulip, tudor, regency, half round and pointed and can be configured in straight, concave, staggered as well as rise and fall arrangements. There are then the options of capping and post capitals to consider. Whatever the design, if it’s not in our photo gallery we can configure it for you to suit your individual design.